Oh, my gosh, people! You have no idea how much I have missed writing! As you may have read, we have a new company, Vertical Host, and they are really awesome!!! However, writing my column was a pain for a while, as they got everything handled. So, I was without a voice! I mean, it really felt like that! I am SO glad to be writing, again! Yes. I am a writer. I know that, now! That doesn't mean I'm a great writer, or even a good writer. Certainly, not a disciplined writer! But, I am a writer! You know how I know? I kept having these thoughts, just like when I write music, where I know I have to go write something down. But, I had no where to write! So, I wrote on my notepad on my cell phone! This is so much nicer! This is where I belong! Home, at ifish! I just came home to the coast and saw Willie for the first time in a week! It was so awesome! I cried for him the first two whole days! And, I got to see him! And hug him! I love him so much! Bill too, of course, but you can't explain to a dog that you'll be back. Bill knew I'd be back! I got up at 5 this morning, flew out of Vegas at 9:50, arrived in Oregon City around 12:30, mowed the lawn real quick, and headed to the coast. I'm here now, and so very tired! But, I'm home! With my family! Where I belong! I'll catch you up, tomorrow. I'm just so darned tired, and dinner is up. I love you all and I missed you like crazy! I got so many notes from people asking if I'm OK, or if I was in the hospital again, or what. No! And I had no way to tell anyone! But, I'm home, honey! I'm home! 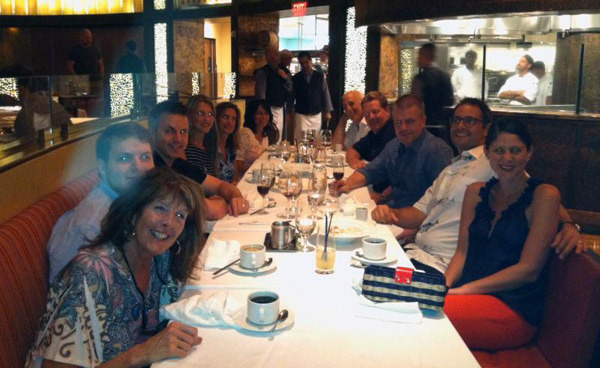 Dinner with Vertical Scope/Allcoast at Mesa Grill in Las Vegas. That's Bobby Flay's place! It was probably the best dinner I've had! Ever! Argh! I've been in Oregon way too long. I had dinner last week with a large group of lovely East coast people. First, I grew up in a non hugging family. I learned to hug (very stiffly at first) when I went on tour with an opera singer to Texas. Everyone hugs, there. So, when in Rome, you learn to hug. When in Las Vegas at dinner with East Coasters, you learn to "air kiss". The first oh, say about 10 times, I returned the "air kiss" on people's husbands necks! Now, that was awkward! I didn't know that you just kiss the air, while touching cheeks! I had to learn that by looking it up on google. Google says it is impossible for two people to kiss cheeks, simultaneously! Well, yeah! And so, as they air kissed my cheek, I really kissed their necks! I mean, that's where my Pac NW "hug" landed my lips! I've got to watch more "Housewives of" New York and New Jersey to see how it's done. My question.... do you "air kiss?" How do you learn all these customs? So much going on, and I'm so "not" going on! I've been dead to the world, since Las Vegas. I say everything I do, and it sounds, sometimes like I'm super woman at 53. I'm so not! I've been pretty much down since I got home. I just can't do this stuff much longer, I fear. I can hardly make it up the stairs after that trip. My back, my legs, everything... hurts! I have zero energy! I thought I was getting sick, but I think, now, I just have marfan syndrome, and I'm old! Bill and I sat on the couch last night and discussed our trip to Yakutat, this upcoming Fall. I can't wait, but at the same time, I fear how tired I will get. I know one thing, unless things change, I'm not going on many trips, any more. I just can't take it, physically! I spent much of last night, laying in bed, looking at inexpensive houses for sale. Ones without yards. I don't know what to do, really, but I do know that having two homes is really getting to me. Like the little engine that could, I thought I could do this "two home" thing. I bought the home for several reasons. One, so the kids would have a permanent home base. Two, so that I would have a place, in case of medical emergencies or treatments, and two and a half, to save on hotel costs, because of those frequent doctor visits. But, it is exhausting me both physically and financially, coming back and forth. When I'm in Oregon City, I miss my river, and I miss Bill. I really "need" to fish! When I'm in Tillamook, I miss my son! So, there really is no answer. But, while David is in school, I promised him a place to be, so that he could afford it. So, do I move back here to Tillamook, and rent him a place? Or, do I buy a cheaper condo like place, so that I don't have so much upkeep? I just have no clue. Both Bill and I are getting older, and although Bill is totally physically and mentally capable of everything, right now, I can foresee a time when we should both be watching over one another. I've always wanted to grow old with someone by my side. I don't think that should be my son. At the same time, I'm cut deep into my heart about the fact that my son is "alone" now. I always thought both Andrew and David would have each other, forever. Now, David is alone. That really stabs my heart. So, I want to be with David, as much as possible. I don't know if it's older age that has me so sentimental about everything, or if it's losing Andrew, but I'm having trouble with separation from anyone or any pet. When I left Willie here in Tillamook to go to Las Vegas, no kidding, I cried all the way to the airport, and my heart was sunken for a full two days, before I could get over it. Then, when I left David in Oregon City, after spending a full four days with him in Las Vegas, my heart ached for our separation! Isn't that ridiculous!? I mean, I had to call him, 5 miles away from him to tell him how much I loved him, and how I would miss him! This is not normal! Is it? We were totally inseparable in Las Vegas, and had the best time, together! He is such a good buddy! In the children's younger years, I spent most of my time with Andrew, as he required the time. David was always just fine. Always laughing, and happy. Andrew was winsome, and troubled, and medically needy. I spent so much alone time with Andrew, driving back and forth to the hospitals and doctors. Bill and I leave for Yakutat right after Labor Day. We will be gone for six days and five nights. I will leave both Willie, and all of our pets here in Tillamook, while some friends of ours enjoy our home, here on the coast. I'm so lucky! Despite all my medical problems, I have managed to live a very full and adventurous life. Even if it takes me days to catch up, and much time in bed, it's worth it! 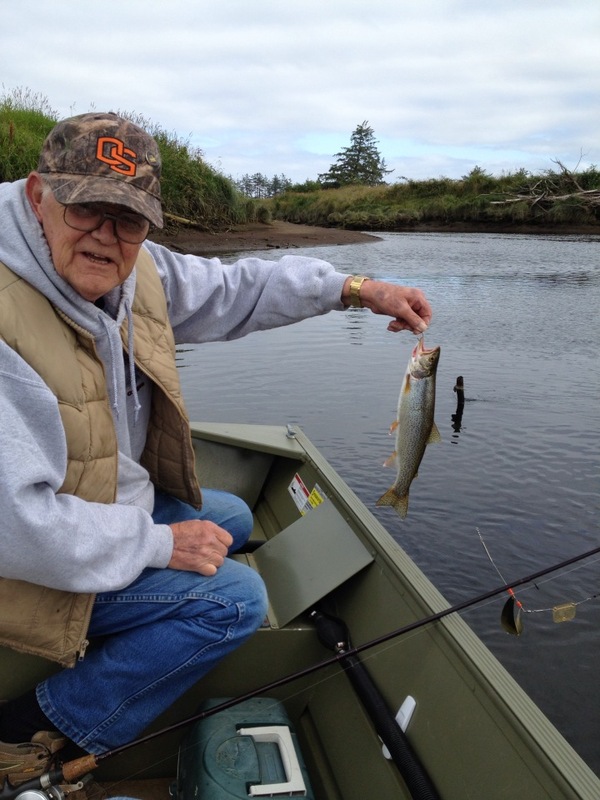 Bill with a nice cutthroat! Bill and I went cutthroat fishing right before I left for Vegas, and man, was it good! We caught and released so many big, fat cutthroat! We are going to do the same, this morning. Then, for me, it's off to the city. I have a doctor's appointment in the morning. Man, did I miss writing, and man, is it every good to be back, so I can get all of this out of my mind and onto paper! Have a great week, and stay cool! I hear it's going to be hot, and I'm headed to the valley! I, Jennie Logsdon Martin, am 53 years old. That was my first thought, this morning, when I woke. I never, ever thought I'd be that "big". :) Wow! I'm glad. It just woke me with a smile. I don't always feel so great, but I feel, and that's a good thing! I have a picture of Andrew on my desktop at home, here in Tillamook. I stared at it, this morning, when I got up. He's looking right at me. It kind of spooked me. I think I'll change it back to Kilchis, my dog. Maybe that won't make me as sad, all the time. Or, maybe even just change it to Willie. That will make me smile. Yeah. I'll do that. Wow. The first few days back from Vegas, I thought I was going to collapse. No, I did collapse! I was so darn tired! I could barely make it up the stairs, the whole first two days. My bones ached! Yes. I'm 53! I'm still glad, though! I can't imagine that in a little over a month, I'm going to Yakutat for constant fishing with Bill. I can't wait, but t the same time, I'm kind of nervous about it. Both, because I have to leave Willie again, and because my body just doesn't react to travel as well as it did, when I was younger. Honest to God, I was so tired from ICAST that it crossed my mind more than once, to check into a hospital! No kidding! I lay in bed just aching from head to toe. Maybe I had a virus. Caught something on the plane? I don't know, but I feel much better, now that a week has passed. I felt like I had jet lag. But, you don't get jet lag from a two hour flight! I am finally caught up. I went to Oregon City and cleaned up the yard, planted a couple plants, mowed the lawn, and picked the vegetables and berries. I have blueberries at Oregon City and at Tillamook! I had wonderful sweet peas that over wintered, and they are dying off. I have picked the pods, for seeds for next year. They are divine! I think you plant them in the Fall, from what I read. I'm going to bring some to Tillamook. You know, I never could get sweet peas to grow at the beach. Maybe this strain is more suitable, because they over wintered in Oregon City! That's amazing! They are huge and hardy, and when they were in bloom, they were breathtaking and smelled so wonderful, when you passed by them. When I got back from Vegas, Bill and I went cutthroat fishing, to try and repeat the wonderful day we had, before we left. We fished the Trask again, where before, we had nearly 20 fish on, and landed more than half of them. They were upwards of 15 inches, and fat! Broad shouldered, wonderful spiritual cutthroat trout! My-oh-my were they beautiful! But, this trip was different! Quiet! You don't want a quiet cutthroat trip! You want to hear giggles coming from that boat! I still giggled, but not about fish! There were none! I caught a smolt, darnit, and Bill also, and that was about it! We have yet to try to compare the conditions, the tide, all of the data, but it seemed to both of us that all conditions were very similar. I guess that's why you call it fishing, and not catching. What a mystery! We got in that boat with all the anticipation of the last trip, but it quickly died! Oh well, we are going to give it another go! That's what keeps us fishing, right? The memories of that one trip! Can't wait for tuna season. You know, I have never been tuna fishing, and I still long to do it.... If even, just once! I want to experience that bite that you read about on the Salty Dogs! Not only that, but I want to have a canning party with my brother and Bill, and stack up jars and jars of wonderful tuna! Yum! The time is near! For those of you that missed my facebook posts during Las Vegas, you can find them on my Facebook page. If you can't see them, you have to friend me, I guess. I also have Twitter, Vine, and Youtube. Wow! There is so many media sources! I even have Tumblr, but that's mainly to talk about my hero, Taylor Swift! I posted about taking David to the go carts on Facebook and Twitter. They go 55 mph! My gosh, but that was scary to watch! But, it sure looked fun, too! I posted a review on the Mesa Grill on Facebook. Oh! And on the way walking to dinner with Allcoast/Vertical Scope, I had to sit down to rest. In order to sit at one of those machines, you have to play it. So, I stuck in $2 for my 'seat rental'. I won $112 or something the first time I rested. The second time I had to rest, I won $200! So, yeah! I'll pay $2 dollars to sit, thank you! I came home with all of the money I took, plus $350! Yippee! The following video is how I prefer my coffee in the morning... except that it gets a little noisy, now days! Willie and I really do have fun, though! Never thought I could love a dog as much as my Kilchi-my-cuteso! Willie digs, we canoe, and we search the river bottom for fish, and well, you know, other lost flashlights! Argh. I keep waiting to find my favorite one on the bottom of the river, and see if it will still works. I found one buried in the garden that had been there all winter, and it worked! Those Coast flashlights are tough! Let's see.... Oh! I have new pictures of me in actual fishing get up! Which one do you like for the one up top? None? LOL. OK, 1., 2., 3., or 4.? I like 1, but Bill cut my head off! I absolutely adore my new waders! They weren't even expensive, either! They are light blue and guess what? PINK! Girl waders with long enough legs for me! They don't sag in the crotch, down to my knees like what fits all you baboon legged men! I was telling Bill how it had been ages since I had a fish picture taken! Well, that's because it's been ages since I have caught a big fish! So, at the very least, I was trying on my new waders for Yakutat, and Bill took a picture of me! 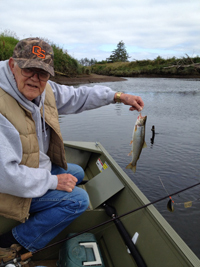 We were leaving to fish the Nehalem. We didn't quite get there, due to afternoon winds, and whatever else. It seems we have the best of intentions, but never quite get on the river! I don't know WHAT is up with that. We keep saying, "Well, as soon as we get the new floors in... After I get home from Vegas... After we get back from Yakutat..." Geemany, but we are lazy, lately! No, it's not lazy. We are constantly doing things. Just not fishing! This house and my other house take a lot of doing! I told Bill this morning, as again, we had plans to fish. "You need to be more strict with us, making sure we fish, instead of watching the rest of the golf tourney, or the news... or watering the flowers. Or, someone does!" We laughed. Someone make us go fishing! Oh, great! I can now write on ifish.net and upload from Oregon City, now, also! Things are moving onwards and upwards with all the new things going on with ifish! I'm so excited about things! Running a large website costs a lot of money and takes so many resources! Think about all of these things, and then understand why I couldn't do it, anymore! Ifish has more than 15 associated programs in order to run all the parts of it. You know, things with user names and passwords and annual or monthly fees. Things like the picture upload feature, the weather station, and the bulletin board software to name just a few. Not only did I have to remember all those user names and passwords, but I had to pay fees on these, and keep them updated by checking for new releases, etc. Always updating, always getting bigger, better, while I was panting to keep up! Then, Ifish hires server techs, coding professionals and people to watch the site at night so that if it went down, someone would know so that it got fixed. I used to do that all myself, but when it got bigger, I just couldn't. I needed rest. Solid rest, and nights were a good time for that. LOL. Ask Bill. Many were the nights I'd get out of bed at 3 in the morning to tend to ifish problems. Some nights I was so tired that it brought tears. Besides all that, I was dealing with marketing, advertising, sponsors and more. That meant an additional stress on my email reading and on me. Book keeping became too much, as remembered who signed up when, and who was to pay when! I used a program for billing called Quicken and it worked really well, but I had to work it, myself. I sent out e mail bills, and kept up with businesses changes of addresses and such. Some folks didn't have e mail, so those went out by snail mail. On top of that, I hired an accountant, so that I could keep up with my business books, and do everything absolutely legal. There were fees, fees and State license fees! Everyone wanted their share. I had zero intention of starting all of this!!! I simply was amazed by the internet and how it worked. Curiosity nearly killed this cat! Way back in 1998, I learned html by a tutorial on the internet. My first internet provider, Don Gach from Seaside Oregon was my mentor. He taught my how e mail worked and I remember sitting at my computer, writing him an e mail and waiting so excitedly for his return e mail! It just made me giggle! I was so impressed! This was magic! The html tutorial was on one of the colleges web sites. I also attended a local class where they used a WYSWYG program to write your web pages by the name of "Hot Dog". Remember that program? Does it still exist? I quickly changed to Dreamweaver, but man, is it expensive! I just had to buy a copy for my MAC laptop and it ran about 600 bucks, just for that program alone! Now it has so many settings that I need to take a class just to learn how this program works! But my self education was very quickly diminished as technology marched ahead of me. I was busy doing all of the above, trying to keep ifish.net relevant, while technology changed from HTML to CSS and more! I didn't have time to keep up on my education! So, while I can still hand code in html, I have no clue how to do CSS or write a shopping cart! Not very many web sites now days use html! I remember how proud I was to know that HTML meant "hyper text markup language"! I knew that CSS meant "Cascading Style Sheets", but I had no idea what that definition meant! I knew that it was easier for people, as they didn't have to constantly be changing code every time they changed a font color or wrote in italics, as it was all done just once in the header of every web page, but I had no clue how to do it, and I still don't! So, now, ladies and gentlemen, we have a company by the name of "Vertical Scope" that has all the resources to do everything for ifish! We can all just sit back and relax! And.... I can go fishing, again! You know, I remember staying up all night long when we did things like change a server, or move to a different host. It was just Pete Morris, myself, and Vaughn and then Christoph, our old techs. Man, I miss them! Never met either one, but I was so close to both of them! They got used to me crying on the phone... "Ifish is down! Help!" I had to wait by the computer for hours as they would change time servers or whatever, and the minute they called, I had to do my part with the board, and Pete, his. I remember crying at night, and I mean big, hard tears... when we had a moderating nightmare, or someone was bullying me or writing awful things on a bathroom wall at a local river put in. I'll never forget fishing on the river and having a lovely day... only to have to use the rest rooms and walk into that. I was in shock! I didn't know whether to giggle that someone was that immature, or to cry. Oh, could I ever write a book! And you know, now that I'm free, now that I don't have 101 things to do, all at once, I think I just might! I have every e mail that I ever wrote or received saved to a hard disk to help me remember the entire chain of events of ifish.net. I have pictures and illustrations of everything, the whole life-long. There are stories that most of you had no idea about, and that will shock you, rock you, and many that will make you (and me, too!) laugh and cry! I will never forget a day in the hospital, recovering from the aortic aneurysm that nearly killed me. My very first "walk" from my bed was down the hall to a computer, where I could see my beloved ifish.net on the screen. I was so very weak. But, I made it! I sat down at that computer, dialed up ifish.net... and cried. I was going to make it! There are relationships that I formed that are the most important relationships in my life. Some of these tremendously loved people that supported ifish and attended every event have passed on, and the entire chain of events are written out and saved. Did you know that for 7 or 8 years I was bullied by someone that just would not let me alone? I received hate mail and heard news of gossip about me on other web sites that were just pure hateful, (untrue) and mean. I had to learn the awful lesson that if someone hates me that much, I must be doing something right! Anyhow, I'm free now! Yay! The other day, Bill said that I wasn't on the "Most Influential in Sports" list, and I cheered! I'm not relevant enough for someone to hate me anymore! YAY! I can write on ifish.net home page! I can run contests and visit with the people that have joined and come to love ifish! I can hand out decals and see them on cars, driving down the highway and honk and wave! I can go walk Willie at the puppy park, and not be afraid that ifish will go down. I'm dang proud of what I've been through to get here, and I'm excited that it's running well and efficiently! It was too much for me, and I believe that ifish.net is in the best hands possible! I believe that God led me to George Scocca from Allcoast, and from there, good things happened! You know, it seems like an awful lot of work to do something like write a book. -To go through those e mails and write down notes about all of the key events. But, then again.... If I could create and run ifish.net, writing a book about it should be a breeze! Remember yesterday when I said I kind of wanted to test out the ifish going down thing, to see how long it took them to get back up? Well, last time we got hacked, it took hours to get back up. Yesterday we went down. People were panicked. It said that your account was suspended, and awful messages that we were an infected site, etc were popping up. Well.... get this! Stew at VerticalScope had things fixed in (drum roll!) 15 minutes!!! We were back up and running in 45! Whoo hoooo! Go, VerticalScope! I'm impressed! It's never fun to get attacked, or hacked or whatever, but man oh man was it fun to see them in action! That said, I apologize for the inconvenience when Ifish went down. It happens. The best we can do, here at ifish, is to see that it gets fixed, and to see that we do all that we can to see that it doesn't happen again. God Bless you all, and have a lovely weekend! I have been staying in Oregon City to catch up on my garden, my lawn, and ohhhh.... my lawn! This lawn project is driving me crazy! I wondered why on earth anyone would have such a small lawn, here. Why they put bark dust down and small pebbles, surrounding a small green plot of grass. I think I know why. All I want for Christmas is Grandma grass! I'm beginning to think, though, that it won't happen till the Christmas of 2100. Grandma grass was named by Andrew. When he was little, he would run barefoot through the grass at Grandma's house in Canby, and sit on the edge by the sidewalk when the train came by. It is very "sittable" grass. There is no dog poop in the grass, and no chicken poop, either. There are no sticks or leaves or anything that can harm bare feet. It's soft. Oh, so reliably soft.... and green! Just pure green! Year around green! How in the world do you get this grass? I have worked year around since I bought this home to get this grass! I will get this grass, and I will get it for Andrew's sake! Bill and I even have a lawn closer to Grandma grass than this stuff! I know about Grandma Grass. It is the stuff that I sat on after a football game with my boyfriend. That's where my first kiss happened. This grass is soft and doesn't have bald spots or brown spots, or moss. It has thick, soft grass that is always cut just right. Never too long. Never too short. I remember that when I was young, my job was to go around and pick up little piles of weeds and take them to the back burn pile. That burn pile got really large! Over my head! On Saturdays, my Mom would yell up the stairs to five sleeping kids, "WORK DAY!" Oh, I hated that! During the Holidays, it was "Christmas is Clean!" But, I digress. If it took five kids and two parents to get green grass, it's no wonder that I can't do it alone! My grass? It has brown spots and big bald spots, and the soil underneath is as hard as a rock. When you water it, it simply rolls off down to where there is a small creek. The creek is dry and thirsty and receives it all. My soil is the stuff that you read about in history books. It is the stuff that our ancestors made clay pots out of. I'm sure of that! At least I have historical soil! The soil in Canby is soft, and brown, and you can sift your fingers through it. If I'd have known about this Oregon City soil, I probably wouldn't have bought this place. I had no idea, and I didn't think to check the soil! Just try to grown a carrot in it! Just try! Carrots cannot even penetrate this soil! My carrots are about an inch long and thick! Beets, the same! If nice grass or gardening is important to you, check the soil before you buy! Has anyone ever told you to do that? On Mother's Day, my sweet brother David came with a thatching machine and thatched my grass. I thought that was going to be magic. But, not so much! My brother told me to buy moss out and perhaps that was my problem. So, I sprayed it all over like the instructions said. My lawn turned an awful black color! I had moss! I did have small patches of green. You know, about an inch here and there. I wasn't happy about the color, but perhaps this was going to do the trick! My son and I spent backbreaking hours with a thatching rake, (yet another cost) trying to get it all up. So, yesterday, I pulled the last of the black up, put grass seed down and then put potting soil over the top. I watered it, thoroughly. Now, I'm getting the heck out of here, so that Willie doesn't bother the growing grass. When I get home, I'm going to have Grandma grass! Right? You know, a month ago or so, a man knocked on my door from a lawn service. He said he could get my grass green in a month, and that he could keep it that way. Without thinking how poor I am, I signed up. I wanted it SO badly! The next morning I cancelled, knowing I didn't have the money, however small the amount was. I could do this! I could do it all alone! I knew I could! But, I'm thinking now that I can't. I'm almost to give up. Soon, you may drive by my house and see that the lawn is gone, and I have replaced it with turf or small rocks, the whole thing. Lord, please free me of the want for Grandma grass. After all, it was Andrew's thing, and he's probably in Heaven sitting on the grass with Grandma, right now. Close enough to the water, so all the fish are clear to see. I just had so much fun writing that, down on the river. Of course, I changed it a bit, but the first lines came to me when I saw her! This tiny little lonely flower, kind of encircled by those white sun bleached rocks! She was growing in the worst conditions, that little flower. I mean, it was in sandy, flat dried soil. I suppose, close enough to the river to reach down to the water, so she could grow. She had to be a she! She just had to be! This bright, lemon yellow little flower was so feminine! It wasn't a dandelion, either. But, had it been, weeds are nothing but misplaced flowers, anyhow! Why is it that things we don't want to grow "fruit" grows lots of it? Like blackberries, and what the heck is this description of what I have, below? I have this vine that drives me crazy around the Tillamook house. I can't identify it. It is invasive! It wraps around all our evergreen trees, and twirls around till it gets to the top, trying to choke it out. I hate them! And I don't hate very often! But, it's killing things that I do want to have grow! It is a bright green vine with big leaves and with two-three inch soft, spiny, weird looking kiwi shaped green fruit like seed pods, hanging from it. And plenty of them! They grow healthy, and produce tons of "fruit!" But, yet, my kiwis, pears, apples won't thrive and grow fruits! Anyhow, if you know what it is, please let me know! I spent the morning pulling it off the trees, poor things! Thought I had it identified as a wild cucumber, but it's not.